A few years ago, Paul Reiche and his team of game developers in Northern California were given a purple dragon and asked to make something cool with it. They were being asked to make a new game about Spyro the Dragon, an old PlayStation favorite created by a different group of California developers who had gone on to make Ratchet & Clank games and first-person shooters. Spyro had been fading. Once a leading mascot for video games, he'd lost his appeal. Tastes had changed since the 90's, and purple dragons started to seem as cool as purple dinosaurs. Reiche and his team tried making Spyro look cooler. They tried "aging him up". It didn't work. "We found that there's a place where you leave Spyro's charm behind," Reiche told me. Reiche's team needed a new idea. That's when Paul Reiche, video game designer since 1980, a man who says he rebelled against his hippie parents by creating his own Dungeons & Dragons books and selling them for profit, remembered his idea about toys. "I'd been thinking for a while about this idea of bringing toys to life," he said. Reiche is a professional nerd. He's got the resume to prove it. Thirty years ago, he worked at TSR on Dungeons and Dragons projects (that amateur work paid off). He helped write that pen and paper game's Deities & Demigods book, worked on Gamma World, labored for the company that became long-defunct PC game development studio Epyx, made two of the first games for current giant Electronic Arts, Archon and Mail Order Monsters. He co-created the loopy, beloved space combat game Star Control. When he gets old and retires, he'd like to travel far to visit friends, to play D&D with them. But before he retires, maybe he'll be the man who helped make toys come to life. If he pulls it off, he'll do it with the help of the enormous Activision Blizzard corporation, the machine behind Call of Duty games as well as the studios responsible for World of Warcraft and Diablo. He'll do it with Skylanders, a video game that could easily be mistaken for a 21st-century version of those old cartoons about toys that were, really, just half-hour commercials for toys. To think of Skylanders as just a cynical product of men in suits would be to get the game wrong. It would miss the hope Reiche has for video games to stop pulling kids away from toys and help them love them again. "I wanted to reinvigorate toys, because I see the magic of toys has dropped." Reiche said during a recent interview with Kotaku. " Younger and younger kids are losing interest in toys…. Video games are so powerful and engaging and fun that toys don't typically compete with your average kid. But I believe there is a place for toys." Skylanders is a toy line, a bunch of video games and the other big holiday product from Activision this season. It will look to the casual onlooker as a line of some 30 statues of cute, colorful collectible warriors, all of whom can stand on an electronic device called the Portal of Power that appears to zap a virtual version of themselves into whichever Skylanders game the Portal is connected to. To Eric Hirshberg, CEO of Activision, the whole thing is "a new set of characters, a new mythology" for kids to love and parents to buy. Skylanders is already pajamas and lunchboxes. It's a Wii game, an Xbox 360 game, a PlayStation 3 game, a 3DS game, an interactive world on the Internet and, soon, a game on mobile phones. "It's kind of like on day one, it has has as many pieces to it as many franchises have after seven years," said Hirshberg, who, like Reiche, talked to Kotaku about Skylanders at a launch event in a massive New York City event space a few weeks ago. The men each answered questions as best they could, when not being vocally over-matched by an announcer shouting to the hundred or so children invited to play Skylanders upstairs: "Who wants to get their face painted?" and, since a pro basketball player was paid to be there, "Hey, boys and girls, look, it's Amare Stoudemire!" Skylanders is an executive's dream. There is just so much to sell. Each of the figures contains a chip that records a Skylander player's progress with that character. If you put the Skylander Stump Smash on the Portal and fight him up to level 4 and make him wear the party hat in the WIi version of the game, the figure will "remember" that and then be at level 4 and wear the party hat if he's put on a Portal hooked up to the 3DS game or the 360 one or the web world. The physical toy stores the digital version's progress. If the Skylanders player is using Stump Smash in the game but comes across a part of the level that can't be accessed by a leaf Skylander but can be by a tech Skylander, then that player can swap the proper figure onto the Portal and keep playing. If they don't own a tech one, well, time to go to the store and buy one. 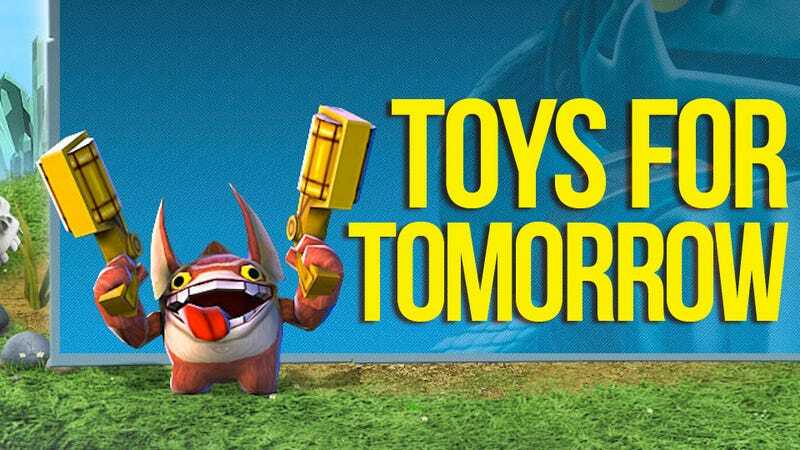 Reiche thought up the basics for Skylanders and has been working on it with his team at Toys for Bob for a few years. After they dropped the aged-up Spyro project, they were doing this. They got a big push from Hirshberg's top people at Activision who said they wanted an idea that would be a hit. "We believe you need to knock it out of the park and make a top-five game, " Reiche remembers them saying. Not a top-five kids' game. "They want a top-five selling game. Period." The Toys for Bob team reacted to pressure by being as ambitious as Reiche, in his 30 year career, had ever dared to be. They crafted the basic Portal and figure tech. They demoed it for the Activison crew. The figure went on the Portal and emerged, virtually, in the game. "It kind of triggers something in you," Reiche said. "I think, in my sort of philosophical brain, it triggers what you expect in toys. Kids expect toys to come to life, and in their imaginations, they do. So what they're seeing there is just the realization in a video game of something they expect to happen." The inner kids at Activision got it. Green light. There are other toys that hook up to video games and virtual worlds. They are mostly made by toy companies, and Reiche laughs them off. "They make a very nice toy and a truly dreadful interactive experience," he said. In the weeks since the release of Skylanders it's become clear that the Skylanders games are anything but a dreadful interactive experience. They've been warmly received by reviewers and players of both the console versions, which were made by Toys for Bob and the 3DS version, which was made by the well-regarded studio Vicarious Visions. The magic of the statue-to-game connection has proved to be the linking of one toy to not just one game but the ability for that toy to instantly re-emerge, retaining all of its stats and virtual accoutrements, in a second and third copy or version of the game. As Hirshberg hoped, the "toy then becomes precious" to the person who owns it. Skylanders could have become a simple, crass shill. The base game, which costs $60-$70 comes with three figures which, collectively, do not represent all the different character factions needed to access each part of the game. "There were discussions along the way of 'Should we allow the game to be finished with just the starter set?'" Reiche said. "And there were voices saying 'no.' And I was like, 'uh-uh.' Not only would I not go for it. Nintendo wouldn't allow you to put out a game you couldn't complete." The team even decided to let players finish the game with just one figure. The developers did include, throughout their game, what look like commercials for toys that the players don't yet own. A player can find an item relevant to one of those un-owned figures and watch an attractive, short video showing the new figure's character in action. But that doesn't reduce the game to being a glorified commercial for toys, Hirshberg said. "I would say that in our very branded, very digital world I think you could make that same comment about a lot of things," he said. "I think you could say that NBA games are commercials for shoes and logo-wear. To a certain extent that's how the world works. In terms of our approach to he game, we're committed to delivering a tremendous value with the starter pack. With the starter pack, which comes with three characters, you can complete the whole game, defeat Kaos, from start to finish, never have to buy anything else." He believes the toys, sold for $8 apiece, are comparable to action figures that have no game to communicate with. Reiche's dream of a rebirth for toys has become a commercial product, one he seems pleased with. His concerns aren't the evolution of the Skylanders to a product line. It's just getting Skylanders to be the dream toys he'd like them to be. Take those virtual character upgrades in the current games. If you put a hat on your character, that doesn't show up on the toy. "What you want is, 'I'm going to put a cool tattoo on my character and it appears there.' It's possible. A few years ago it was impossible to do what we're doing today. The sky's the limit." A few weeks since the big New York City event, Hirshberg describes Skylanders as still being mid-launch. He's not ready to say how well the games are selling—whether they've hit Top 5 status or not—but he's angling for the series to get "a ton of momentum as 'the' gift for the holiday." Reiche, not ready for D&D in a retirement home, has his own dreams, too. "I want to see more stuff like this," he said in New York. "What I hope is that, a year or two from now, a kid goes into the store expecting the toy car or the robot that he gets is going to come to life. I bet you they have to."